New links ITALOBUS are active with the city of Matera with destination Salerno Central Station, particularly Taranto. Marino motorways connect Matera to Milan, Ancona, Bologna, Chianciano, Fiuggi, Naples, Novara, Parma, Reggio Emilia, Sassuolo and Urbino, as well as numerous foreign cities. The Marozzi and Liscio buses connect the city to Rome, Florence, Pisa and Siena. Train stations served by Trenitalia closer to Matera are those of Bari and Ferrandina. From Bari you can reach the town of Sassi on the trains or buses of the FAL, while from Ferrandina you can reach Matera only by bus. Bari Palese Airport is approximately 30 minutes drive by car. From the airport you can take the Pugliairbus, the land transport service that connects the airports of Brindisi, Foggia and Bari, Taranto and the city of Matera. 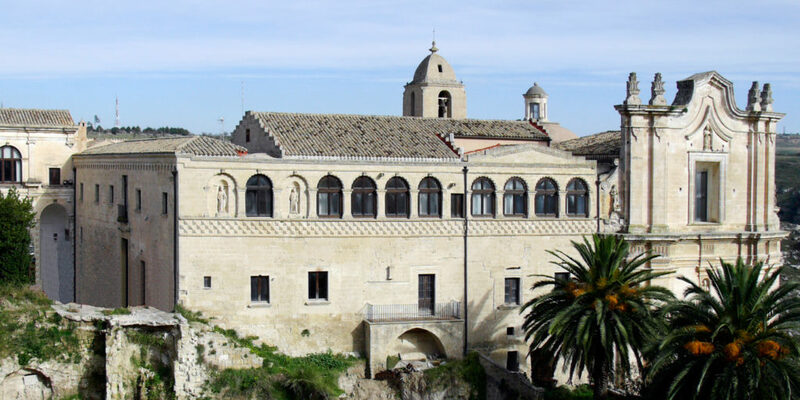 The Convent of Sant'Agostino in Matera, an important and elegant monumental complex of the late 16th century, located in the upper part of Sasso Barisano, in a symmetrical and mirrored position at Palazzo Lanfranchi (home of the National Museum of Medieval Art and Modern of Basilicata). The complex is made up of the monastery built by the Monks of the Order of the Emerituss of Sant’Agostino, built in 1592 and by the Church of Santa Maria delle Grazie, built in 1594. The first was founded on an ancient hypogeum dedicated to San Guglielmo da Vercelli . Destroyed in 1734 by a terrible earthquake, the complex was restored and later became the seat of the General Chapter of the Order of the Augustinians. The convent was then abolished. Between the church and the convent, the bell tower is raised.